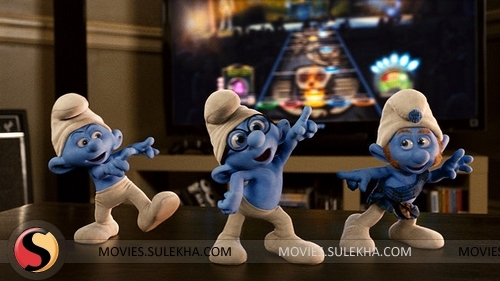 In an age of sublime computer animation and clever storylines that appeal to both children and adults, The Smurfs silver screen debut is almost an insult. Not only does the plot lack any cohesive direction but the mash up of animation versus the ‘real world’ removes the magic that is so important to the conception of Smurfs as otherworldly beings. With directorial credits including Scooby-Doo (1999) and Beverly Hill Chihuahua (2008), Raja Gasnell has certainly kept to an increasingly boring formula that highlights a lack of creativity and ultimately leaves the audience wondering ‘why’? The film kicks off with a brief introduction to the world of the Smurfs, who live in a perpetual state of happiness, despite being continually subjected to the cruel intentions of their enemy Gargamel (Hank Azaria) and his cat sidekick Azrael. 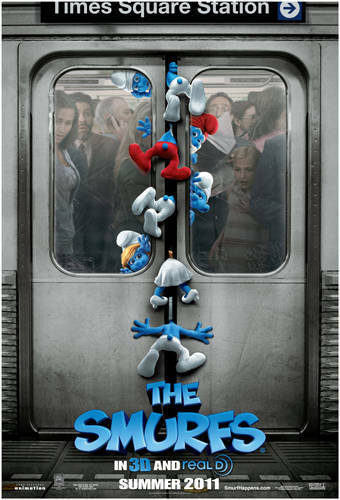 Following yet another altercation with their foe, Papa Smurf (voiced by Jonathan Winters) and a motley crew of little blue guys flee to modern day New York in the hope of escaping Gargamel’s evil clutches. Predictably, the villain follows them to the Big Apple and the Smurfs are forced to seek help from advertising executive Patrick (Neil Patrick Harris) and his pregnant wife Grace (Jayma Mays). Wrestling with his anxiety of impending fatherhood and the arrival of the Smurfs in his life, Patrick is forced to address his fears and help the magical midgets get back to their home world. The amount of factors that contribute to this train wreck are numerous. The overly predictable plot and clunky dialogue are the front-runners for why this film is almost unwatchable, especially when in lieu of actual sentences the writers use the word Smurf instead (‘That is so Smurf!’ ‘Smurf you!’ ‘I kissed a Smurf and I Smurfed it’ etc). This form of dialogue is prevalent in the original cartoon but on the big screen it displays laziness instead of creating a more polished script. The human characters in comparison to the digitalized Smurfs look out of place and the comedic talents of Azaria and Harris are wasted in favour of cutesy moments, complete with lessons learnt and triumph over evil. The star power of Sofia Vergara and Neil Patrick Harris doesn’t do the film any favours and the human scenes between the two are humourless and boring. The film’s focus is of course on the Smurfs, yet if the creators insisted on including humans couldn’t they have made them with a semblance of charisma? The animation of the Smurfs themselves is vibrant but not groundbreaking and watching the film in 3D will not enhance this abysmal experience. If there can be found one ounce of entertainment in this film it is in the portrayal of Grace by Jayma Mays. Wide-eyed and enchanted by her minute houseguests, Grace gives the story a heart that is barely beating. Her scenes are strikingly simple and yet she conveys the wonderment that every human would surely experience if they happened upon a happy, singing little creature. The creators of The Smurfs must have been working under the assumption that children are not intelligent: put something colourful in front of them and they’re squeal like its Christmas morning. This belief should be immediately discounted, as personal experience suggests that children want more than little blue things shouting ‘Smurf’ at opportune moments (not a giggle nor a gasp was heard at the media screening). Having been educated by the gold of Pixar and DreamWorks animation, this reviewer left the theatre with a serious case of the blues that was only cured by a beacon of hope in the form of The Pirates! Band of Misfits, which will be released later this year.